On the 3rd of November, The Spindle hosted a lively kick-off event for the first ever Spindle Cycle: a four month cycle to boost ideas and innovations and to strengthen and connect innovators in development around a specific Spindle theme. The first Spindle Cycle is themed The Civic Power Cycle, focussing on new ways to be more effective and efficient in civic space, which is shrinking worldwide. To launch the cycle, we hosted a serious game event, with a game developed by Perspectivity, called the Human Security Challenge and a discussion on challenges and new strategies in civic space. Several member and non-member organizations of Partos joined the afternoon for some heated negotiations and insightful discussions. The Human Security Challenge confronted all participants with limited resources, crises, conflicts and negotiations. Divided in six fictitious nations, the participants faced crucial trade-offs between long-term stability and short-term national interests. Interestingly, almost all groups pursued short-term national interests over long-term stability, as negations were hardly used to pursue the group interest (long-term stability). Consequently, the group experienced many crises, as tension rose between the fictitious nations. 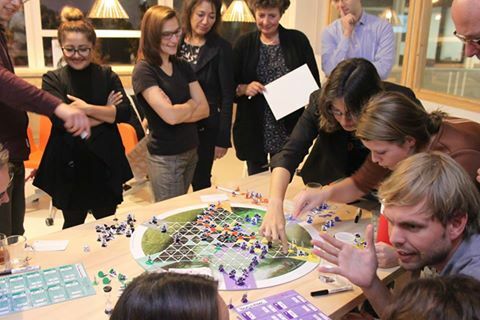 The debrief however revealed that many participants felt powerless during the game, as crises dominated, making the game very unpredictable and destructive. Other participants felt upset and cynical, as there was no cooperation among the different nations to avoid crises. The debrief, as such, stressed and encouraged an appreciation for the benefits of mutual cooperation and of long-term sustainability. Similarly, mutual cooperation can also be a channel through which to expand or reclaim civic space. This was also emphasized during the discussion on challenges and new strategies in civic space. Barbara Oosters (Oxfam Novib) stressed the importance of engaging with the private sector and researching their effect on civic space. Additionally, she argues that we can only approach the private sector effectively with prior conducted research (religious organisations can be an inspiration for this). Melanie Rieback, member of The Spindle Inspiration Council, added that the only way to invoke (social) change among large businesses is to hurt them economically, by for example supporting social start-ups who can market the ethical alternative. Other ideas for further exploration were about new ways of empowering, but also protecting, civil activists in countries were civic space is shrinking and what role for example diplomatic missions can play in this. Overall, interesting ideas and insights were discussed and due to the complexity and urgency of the theme, more exchange is desired among the participants. The Spindle is very much open to facilitate these exchange. The next activity in The Civic Power Cycle, namely, The Spindle Clinic on the 22nd of November.